Just a little interesting thing I noticed about this New Scientist article about Kanzi, a bonobo who has, over the course of 30+ years working with humans, learned to do…something. In fact, he’s learned to do a vast number of things, but it’s hard to say what he knows, because people keep tripping over the language used to describe what he knows. The question appears to be whether, when an ape, say, uses matches as a tool to start a fire (and then cooks a marshmallow on a stick over it), the ape is using matches as a tool to start a fire, or if it is imitating the uniquely human ability to use matches as a tool to start a fire, without actually having that ability itself. Apparently the scientists have taught Kanzi how to make stone tools which resemble those made by our ancestors. And here he is in a video, spontaneously making one and then using it to open a log in which some food is hidden. The New Scientist article duly reports upon this ape which can make and use primitive tools which closely resemble early human tools, but ends with a lot of not-entirely-impartial reassurance that this tool-using ape is not really a big deal, because Kanzi was taught by humans to perform this task, and “whether the behaviour could arise in nature is unclear”. Why does it matter whether apes can make stone tools? One of Jane Goodall’s most controversial discoveries about chimpanzees (cousins to the bonobo, and also apes) was that they made and used (not stone, but plant based) tools. This disquieted people because humans had been using “use of tools” as one of the distinguishing characteristics which “set man apart from the animals“. This begs the question Why does man need to be set apart from the animals? but I digress. The discovery was made almost fifty years ago, but we have not yet gotten over this issue. Look at how worried the New Scientist article is about implying that apes can use tools, or behave even the least little bit like humans! “Since these animals are raised in unusual environments where they frequently interact with humans, their cases may be too singular to extrapolate their talents to their brethren.” I might say they were being cautious about not extrapolating things from the original research which are not strictly true, but when the same publication wrote an article about how scientists have produced a substance which temporarily halts reproductive ability in male mice, it did not use a title like “Scientists Temporarily Halt Reproductive Ability in Male Mice”; it announced “First Non-Hormonal Male ‘Pill’ Prevents Pregnancy“! Clearly this is not a publication unduly worried about implying possibly misleading things through overenthusiastic interpretation of research results. Likewise, the title of the Kanzi article is the somewhat sensationalist “Bonobo Genius Makes Stone Tools Like Early Humans Did” — an assertion which the rest of the article then goes on to state, then almost flat-out deny — and there, again, is the bias. How do we know Kanzi is a genius bonobo? Apes are hard to keep in captivity — our sample size in this particular research is two bonobos. Kanzi could be a genius, unusual bonobo…but is it not more statistically likely that he is somewhere under the “average” part of the bonobo bell curve? Why is it so important that he be exceptional? Contrast the New Scientist article with articles from the Huffington Post and the Daily Mail, both of which serve a more animal-friendly clientele. No mention of how this behavior may not occur in the wild (Do wild bonobos need stone tools? Is there evolutionary pressure for such a talent? ), just a lot of admiration (and, alas, reference to that bedeviled “baby chimp feeding a baby tiger” photo which really needs to stop getting passed around). In fact, both of these articles actively paint pictures in which Kanzi is replicating the first steps of the human journey towards tool use and civilization. What an interesting contrast of style! This photograph, from this article (and many others), has been wandering around the net for a bit recently. 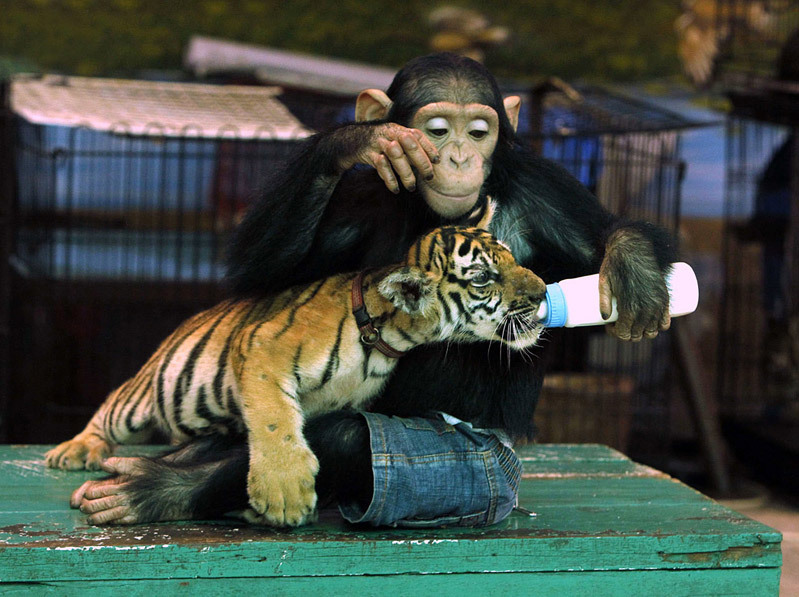 The animals are billed as being from the Samut Prakan Crocodile Farm and Zoo near Bangkok, Thailand. Look in the background of the pictures. Look at the big cat cubs kept alone in small dog kennels. There’s a pair of them playing unsupervised on the floor. Look at the stacks of cheap dog kennels — does this look like a reputable zoo to you? How reputable does this photo from their “elephant show” (taken from this web site) look? Check out the reviews on TripAdvisor.com — apparently the primary moneymaker for this facility is selling crocodile skin. It started life as a crocodile farm and seems to have picked up some random exotics for the extra cash. Is this what you want to support? Quit sharing this “cute” picture without the full context. It encourages people to think you can keep chimps and tigers as pets (hint: bad idea), and it’s generating publicity for a facility which encourages tourists to pose feeding and holding baby exotics (I can only imagine they pay for the privilege), mishandles them in “shows” (more photos here, here, here, and here, and in piles from Google image search), and slaughters crocodiles for leather and meat, as well as encouraging other facilities to do the same. Facilities like this routinely mistreat their animals. The previous example mentions China, but it happens everywhere, Thailand (and the US) included. Don’t support this kind of thing. You like tigers? Go here and support them. Love chimps? Go here and support them. Put your effort into places that deserve it. Don’t lend your time or blog space to this facility, unless this is the kind of animal husbandry you wish to support. 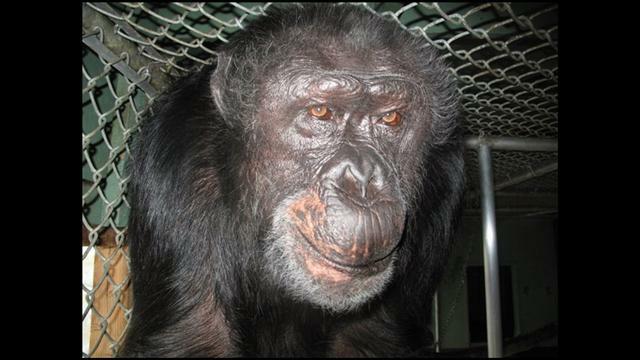 Various news sources are telling me that a “cigarette-smoking chimpanzee” passed away on Saturday, December 10. The name of the chimp in question is Booee (or Booie), and this immediately pinged my memory: was that not the name of a signing chimp — one of the chimps that researcher Roger Fouts communicated with while he was raising Washoe, arguably the most famous of the signing chimps? I wasn’t hallucinating. Here’s a link to a heart-rending little scene from the book Next of Kin, where Fouts describes meeting Booee again after many years apart. And that’s the same Booee, a lifelong lab animal, unwilling participant in probably several dozen experiments until being briefly featured on a television show made him less than political to keep. He was moved to the Wildlife Waystation in California in October, 1995. This particular chimpanzee could speak to humans. He used sign language to do so, but he could do so — one of the first of a tiny wave of “animals” which could speak a human language. He was part of the community that helped open the door between humans and their closest cousins, the great apes, and helped to start the (still ongoing) movement which is trying to get chimpanzees out of the laboratory. He is part of the snowball that started the avalanche of things like the Great Ape Protection Act, which would have been unthinkable when Booee was born. This guy is one of the founders of a little, slow, quiet revolution in the way humans think about animals. And something like 90% of his obituaries say “he was on television once”, “he smoked cigarettes”, and “he begged for candy”. Why are those chosen as his defining attributes? Are they just the only ones the news outlets think we’ll understand? Booee is a historical figure. He did a lot for animal/human understanding and the promotion of the idea that animals are not just automatons with fur. It might be hard to encapsulate the meaning of what he was, what he did and the way he changed the world into a blog-sized sound bite, but “cigarette-smoking chimpanzee”? Is that all we can come up with?